All about your ninth System, Field and Inner Aspect. Perception is more than the process of viewing. It is the act of sensing differentiation. Perception is representative of the capacity for insight, appreciation, view point, and knowledge to be gained. Perception implies a series of levels of sensitivity to that which one can sense, providing levels of awareness beyond simple observation. Middle English percepcioun, from Old French percepciÃ³n, from Latin perceptio, perception, from perceptus, past participle of percipere, to REALIZE. How to meditate using the Perception Breathing Technique. This breathing technique can allow you to access that place that spans between physical and beyond. When this is done correctly you can feel a bit light and floating at first. Then as you continue calm and certain become the operating modality. From this expanded view you can easily divine auras and colors much more readily. 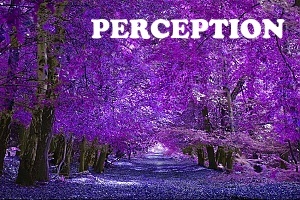 All about the color of Perception (purple). The color that best represents this system is purple. The qualities of purple are those of insight, feeling full, regality and spiritual. Although it is a proper color in its own right, Purple can be derived from the combination of red and blue. It unites red&apos;s fiery out-flowing energy with blue&apos;s cool inward-moving calm. The &apos;sound&apos; of Perception and how to use it. This is the sound that places all the energy into clarity by the process of delineating all of its parts and placing them in an order that will give them an affordable outcome. Through the energy of ordered knowledge, comes the clear view of what needs to occur so that life or livingness can continue in its most optimum form or flow. How to scan a person&apos;s Fields and Inner Aspects for issues. In this Workshop you will learn the technique for scanning a subject&apos;s Inner Aspects and Fields. Remember, these structures contain much information, some good and accurate, others implanted by trauma or dysfunctional upbringing or unresolved forms concerning other lifetimes. Scanning enables the ONA practitioner to detect irregularities in the Inner Aspects and Fields. How to use the ONA Perception Technique to use sight and touch to trigger deeper awareness. In this technique we will be examining the physical body by viewing and touch. This can be accomplished by simply seeing what a person looks like and assessing the structure and posture and movements of their body. You&apos;ll want to pay particular attention to symmetry and uniform movement, and whether they can perform the same functions on both the left and right sides of their body. See if they have flat or arched posture in one area of the body. Make note of anything that could give you cause to see if there is color distortion, skin issues, evidence of previous operations, or other scars. Note if it appears bones have been broken or if they have had cuts or punctures an any area of their body. This is becoming aware of the person from what seems obvious.